Few foods stir as much passionate devotion as chocolate, and in my mind chocolate truffles are about as romantic and decadent as you can get. So when Johanna of The Passionate Cook chose chocolate truffles as the theme for this month’s Sugar High Friday (SHF) event, I couldn’t pass up the opportunity to indulge. SHF was started by Jennifer, The Domestic Goddess, and each month food bloggers from around the world serve up a tasty smorgasboard of delectable treats to celebrate the event. Truthfully, it’s been a while since I made truffles. I rarely get to cook these days without one or two little boys by my side “helping.” I’ve witnessed my four-year-old and two-year-old roll cookies in sugar, and it made me realize that letting them roll anything as wonderfully gooey as a chocolate truffle would invite disaster. None of the chocolate would be left by the time they finished licking their hands and everything else, and that would just really ruin the romance of the whole thing. So one night when Michael was out of town on business, I got all three of the boys to bed and treated myself to an evening of rolling chocolate truffles while I watched the movie Don Juan DeMarco. The only thing that could have made the evening better, besides having Michael at home, would have been a DJDM and Chocolat double feature, but alas I don’t own the latter DVD yet. These truffles combine the wonderful flavors of chocolate and coffee. Don’t skimp on the chocolate, because truffles are all about treating yourself and anyone else who gets to enjoy the fruits, er chocolate, of your labors. 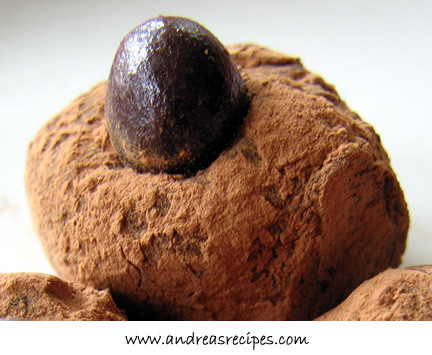 UPDATE: Check out the round up of all the SHF #25 chocolate truffle recipes at The Passionate Cook. The photos will make your mouth water! 1. In the large sauce pan, begin melting the chocolate over medium heat. When it’s about half melted, add the cream, butter, espresso powder, and Kahlúa. Continue cooking and stirring until the mixture is smooth. 2. Pour cooked mixture into the other bowl and chill for 4 hours or until firm. 3. Scoop out one teaspoon of the mixture at a time, forming into balls. Roll the balls in the cocoa powder. Press one half espresso bean into the top of each and place the balls on the baking sheet. Chill truffles for 1 hour or until firm. 4. Keep in airtight container in refrigerator for 2 weeks. boyohboy, four men in the house and still finding the inspiration to make truffles… i am in awe! Your truffles sound absolutely delicious, with milk chocolate i am always worried that they might not harden enough – but I do love good milk chocolate and the addition of coffee is a great idea!